Plantar Fasciitis, an Overuse condition. 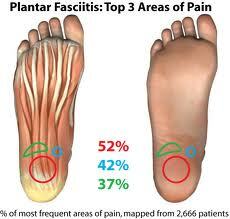 Plantar Fasciitis is another overuse condition this time affecting the Plantar Fascia of the foot. It usually presents as tenderness/ pain upon palpation and is provoked by exercise or movement. Due to overuse or because of excessive stress placed on the fascia the tissues fatigue and eventually are damaged often at the attachments near to the heel bone, the Calcaneus. This overuse can cause the breakdown of collagen and overwhelm the tenocytes (cells that produce new collagen) therefore disrupting their synthesis of collagen. This condition is a common cause of foot pain in athletes especially those over 40 years old but can affect people as young as 20 if the athlete is very active. Stress on the fascia and so Plantar Fasciitis can occur in less active people dueto excessive pronation of the foot causing a collapsed medial longitudinal arch of the foot, the main inside arch of the foot. Here the excessive pronation stretches the plantar fascia, supporting ligaments and the small muscles (the Intrinsic muscles) of the foot. However people with high arches can also be affected due to increased forces at toe push off during the Windlass mechanism. Long periods of standing or weight gain are also Plantarfasciitis risk factors. Here two different approaches to treatment would arise with taping or orthotics being used to support the pronated arch as opposed to stretching to help the stiff supinated foot.All these factors can leads to microtearing of the fascia near the Calcaneus. The Plantar Fascia runs from the medial (inside) process of the Calcaneus to merge into the Plantar (underside) surfaces of the Metatarsophalangeal joints, MTP joints, (these are the joints on the underside of your foot at the base of the toes) and the Flexor tendon sheaths (the tendons that flex, or scrunch up your toes). There is a large middle portion with smaller slips medially and laterally (please see picture alongside). The function of the Plantar Fascia is to act like a bowstring in your foot during the midstance phase of your gait cycle (or in lay terms, when you have your full weight on one foot as you walk along) where it helps bring the toes and the heel together so raising the medial longitudinal arch. In biomechanical terms this helps to load the Plantar Fascia up like a spring thereby absorbing some of the energy from the initial impact of the foot on the ground which is then released during the toe-off phase of the gait cycle to help propel us along. The Plantar Fascia connects into the fat pad covering the plantar surface of the heel of the foot which is another shock absorber during heel strike. In addition the lower leg muscles, especially the larger Gastrocnemius and Soleus muscles also help to control shock absorption when walking or running. It also reduces tensile forces in plantar ligaments and helps to reduce ground reaction force on the Metatarsal heads late in the gait cycle during propulsion. As mentioned above excessive pronation perhaps due to a collapsed arch can lead to stress and microtearing of the Plantar fascia. If the opposite condition occurs where the foot has excessive supination (a high medial longitudinal arch) then the foot is more rigid as the outside arch (the lateral longitudinal arch) is formed mainly by the foot bones (the metatarsals) and has less shock absorbing abilities leading to more stress going into the Plantar fascia and heel fat pad. This leads to the Soleus muscle compensating with increased activity placing even more stress on the Plantar Fascia and Achilles tendon so making matters worse. These last two are examples of intrinsic biomechanical factors. Plantar Fasciitis is caused by Overuse. That Overuse can be due to overtraining, poor technique, hard surfaces or prolonged standing and especially when an activity requires the ankle to plantarflex (when the foot is pushed down) whilst the toes are extended i.e. during the toe off phase of the gait cycle when running or dancing. It can often occur if there is a large or fast change within a training program. Factors that will play into or predispose towards Overuse are: Poor Biomechanics are detailed above with the excessive foot pronation or supination, Short/Tight Gastrocnemius and Soleus muscles which will pre-tense the Plantar fascia perhaps predisposing the foot to pronation in addition to lifting the heel early in the gait cycle which will also put more tension through the Plantar fascia, Poor Footwear that is too old/worn out so is too flexible and not providing adequate arch support or conversely footwear that is too stiff, Weight Gain which will obviously put more strain through the plantar fascia and this can include pregnancy. The symptoms of Plantar Faciitis can vary from mild to severe and can be with one or both feet. The pain usually has a slow onset with no causative injury or trauma. There is usually little or no swelling. It starts with an acute phase which if left untreated will develop into more like a chronic tendinopathy where the fascia will thicken but there is no true inflammation. 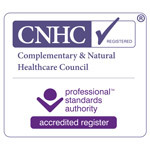 At this point NSAID’s (anti-inflammatories) are of little use, it isn’t truly inflammed. Pain is normally felt on the first few steps after non weight bearing such as getting up in the morning because the Plantarfascia fills with fluid and swells. Therefore a few steps are needed to wring this fluid out, reduce the swelling and allow you to feel better again. It is worse when the weight is fully on the effected foot (the pre-swing phase). 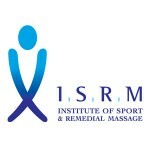 The pain will often return after 2+ hours of continued activity but is usually relieved by rest. You can always use ice in it’s pain relieving role at this point if you wish. As shown in the picture above the pain is usually felt on the underside of the heel but may also extend down the medial border towards the toes. Parethesia (tingling, prickling, burning etc) maybe present due to compression of the medial longitudinal arch. The symptoms may present alongside Achilles tendinitis and a bony spur can develop on the medial aspect of the Calcaneus from the continual tension of the Plantar fascia causing bone to be laid down due to increased fibroblast activity. As with all Overuse conditions the treatment of Plantar Fasciitis should start with Rest. Ice can be applied as daily pain relief since NSAID’s as mentioned above have little effect . 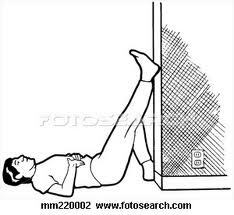 Help from a sports massage therapist etc can be sought even during the acute phase as work on the lower back, back of leg (especially the Gastrocnemius and Soleus) can reduce the external tension into the Plantar fascia. This work increases foot dorsiflexion therefore decreasing compensatory foot pronation. They can also help assess and improve upon Poor Hip Control since weak gluteals and hip rotators will allow excessive internal rotation and adduction at the hip further leading to increases in foot pronation. Controlling his can reduce the need for a corrective foot orthotic. 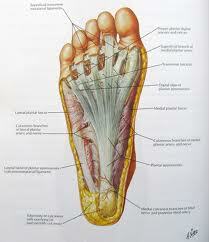 which may have been fatiguing previously so not supporting the Plantarfascia by allowing overpronation. 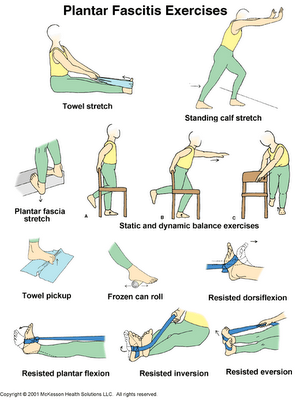 Again their therapist will help provide exercises here along the lines of the images showing work with either a Theraband or performing a towel pick up (below). Work started in the acute phase on any tight calf muscles will be continued to improve upon foot dorsiflexion.
. Then the set of stretches in the next picture can be performed, starting with the static stretches before the dynamic balancing exercises. The towel stretch shown is also a hamstring stretch and the frozen can roll is anecdotally very relieving! Other courses of action one should consider is to review your footwear, is it too old etc. Go to a running shop for instance for a re-assessment. You should also look at your training regime to make sure that any changes are transitioned well and not too abrupt or extreme. Do not increase any training regime loads by more than 10% week on week for instance. This is especially the case if you are moving over to fore foot running. You could also perhaps go to a qualified Podiatrist if you think that biomechanical factors such as overpronation or supination might be involved in your case. Every one, athlete or non athlete should continue to stretch the legs and calves if you have suffered from this condition and make sure that your Gluteals are as strong as possible. If you are an overpronator strengthen your small intrinsic foot muscles and stretch your Plantarfascia if you are an oversupinator.